“I don’t know.” It’s a common response from students, particularly on those days when I make a point of calling on students who are avoiding eye contact and trying to hide behind someone. And I will start by saying this: It’s OKAY to not know. The tricky thing is trying to assess the reason for the “I don’t know.” Sometimes they know a bit, but can’t synthesize it or articulate it. Sometimes they know a bit, but not enough. Sometimes they know, but don’t know they know! In any case, here are a few of the ways I try to stretch that ubiquitous response out of the realm of a shoulder shrug and into the realm of critical thinking and metacognition. I picked up the first one at a workshop (about something totally different) several years ago. It seemed ridiculous to me at the time, but students actually respond to it! Other times, I might tell a student that I will take some other ideas while he or she thinks about it more. Some students just need a bit more time to consolidate the information. Sometimes a student can better synthesize and formulate a response after hearing it in the context of what other students are thinking. 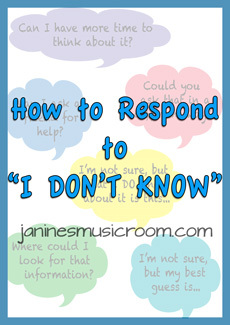 If you are hearing a lot of “I don’t know” in your class, you might want to give your students some actionable ways to respond instead. You can also download a free poster with some prompts here. How often do you hear “I don’t know”? What strategies do you use to coach your students forward?